What do we use a leaf area meter for (Area Meter 350)? This series aims to provide a more comprehensive picture of the work and developments of the GINOP program by introducing on our website some of the instruments applied in our researches. Leaf area is an important agronomical parameter as it is reflecting environmental conditions, related to plant growth, photosynthetic capacity and many times it indicates anomalies of the plant (e.g. yellow leaves can be a sign for iron deficiency.) The area meter is a portable device that measures the main visible features and some morphological markers of the leaf. The device consists of a central unit that performs measurement and evaluation, memory and battery are also placed here. The other one is a reader head connected to the central unit with a cable, which functions as a scanner: illuminates and scans the sample. Firstly, the leaf to be measured is placed under the transparent foil in the measuring area, and the reader head is drawn through the measuring area. Right after scanning is finished, the main details of the leaf are immediately displayed: length, width, surface and perimeter. Measurement data, together with leaf images, may be automatically recorded on the large internal memory or saved to a PC. 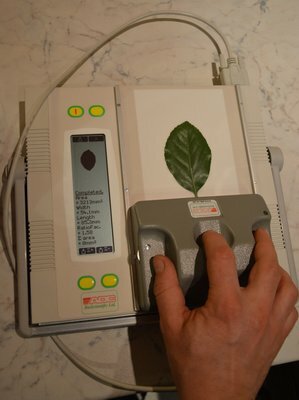 The device separates the leaf from the white measurement area by its contrast difference. The instrument is most often used to compare the leaf sizes of treated (e.g., under drought) and untreated (control) plants.